This exhibition juxtaposes the work of two artists who are committed to abstraction, and particularly to its exploration in terms of the intersection of color, form, and medium. Working in fabric, plastic, vinyl, Plexiglas and other assorted materials, Ivelisse Jiménez and Doreen McCarthy both approach the solid forms of geometry, the patterning of abstraction and the simplicity of line in related ways. The dominance of geometric abstraction throughout the Americas in the twentieth century marks it as an important presence that remains powerful. The application of line, color and form in a rich, sensual way marks these works as contemporary objects that draw on this long tradition of geometric and abstract work. Despite their abstract nature, these works make reference to actuality, to the context in which they are created, and their materials underscore these connections. The intent of the works is often multiple, emphasizing the connections between what is real and the visual experience of the viewer. Works in the show are products of both their physical and their cultural environment. 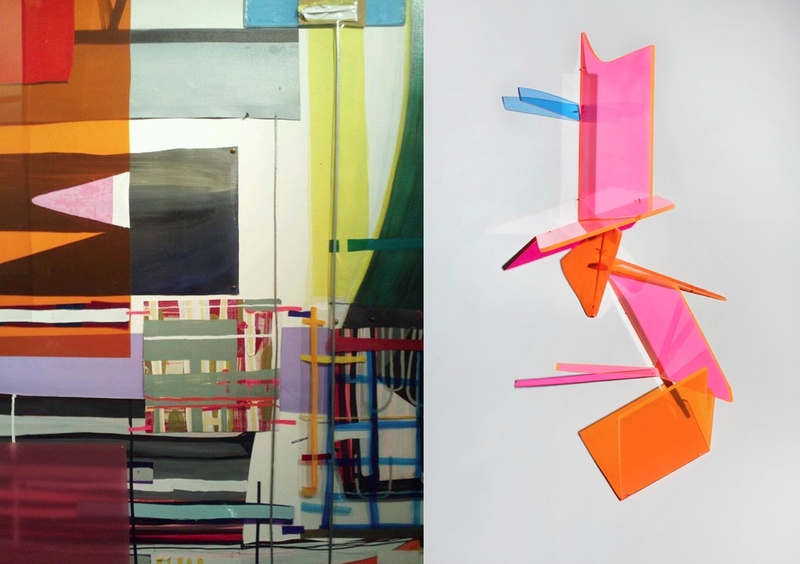 These two artists, from very different backgrounds and at different stages of their career, choose to continue to explore abstraction and geometry through its possibilities, boundaries and connections. Relating space, human perception and experience, color and form in their works, they ask viewers to explore and reconsider these characteristics through their works. Ivelisse Jiménez makes abstract, three-dimensional wall works that re-inscribe the flatness of the wall by making reference to it through layers and layers of appliquéd and hanging plastic forms. Suspended from the wall like a painting, each work is built up by stitching multiple layers of fabric, vinyl, buttons, fabrics and other materials together. Playing with both color and shape, Ms. Jiménez’s works are like abstract maps of a futuristic urban landscape. The artist has had solo shows in the U.S. and abroad, including Spain and Italy and was recently an artist-in- residence at ArtOmi. Doreen McCarthy has been making geometric and abstract sculpture for many years. Working in surprising materials as such as Plexiglas, plastic, and vinyl, the artist creates simple hardedge works as well as softer, inflatable sculptures that erode the strict boundaries, the edges between forms. Each work becomes an exploration of the possibilities of the nexus of space and color. Doreen McCarthy has shown her work nationally and internationally, including numerous solo shows in New York, Miami and Cologne.